samples: Smash and Teeny with visuals by Additv (January 2007). 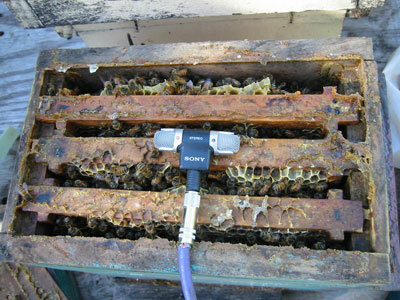 Live electro-acousticaudio/visual improv derived from bees and other insects. Bee Space is the measurement of space - the width of a single bee - which honeybees will allow to exist in their hives which will not seal with wax or propolis (e.g. 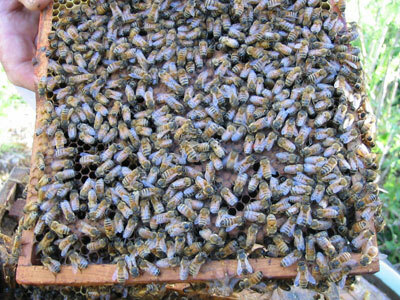 the space between frames in a managed hive). Smash and Teeny (audio) recorded live at I/O Media Aboveground (InterAccess Electronic Media Arts Centre, Toronto Friday, January 19, 2007); video by Additv (Rob King); this is a recreation of the video Additv was performing live with us. Audio recorded and mixed by Ted Phillips. Sarah Peebles - laptop, mixing bowls, speaker drivers, and pre-recorded sho (mouth-organ). Rob King is an artist, researcher and student in the Communication and Culture masters program at Ryerson. His works have focused on the social interactions between people in an online environment, emergent systems, and digital play.